Desktop Curtain 3.0.9 – Displays temporary desktop picture in front of real one. 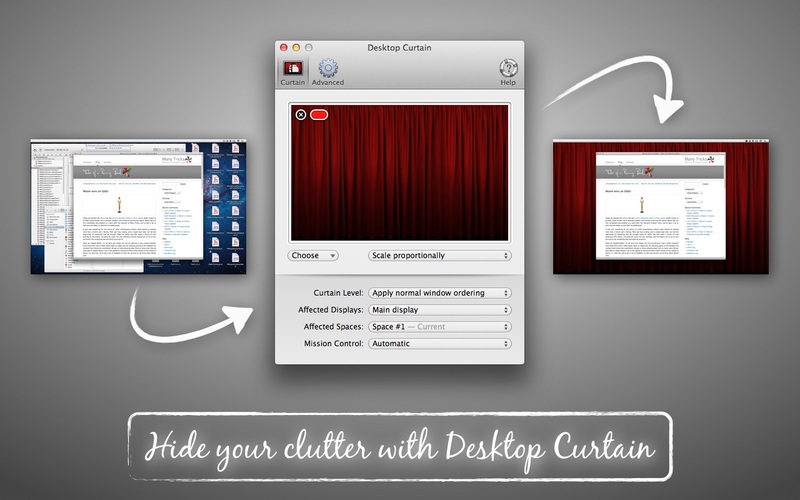 Desktop Curtain is a simple tool to hide the clutter on your desktop. It’s perfect for teachers, presenters, writers, developers, and anyone else that hates clutter and/or needs to take screenshots with a clean background. Added support for macOS 10.14's non-dynamic desktop images. Added support for macOS 10.14's Dark Mode. Worked around an occasional crash in the App Store version of Desktop Curtain. Next story Smultron 11.1.4 – Easy-to-use, powerful text editor. Previous story TrashMe 2.1.21 – Uninstall your applications by deleting all related files. HyperDock 1.3.2 – Select windows by moving the mouse over a dock item and more. TotalSpaces 1.2.2 – Brings grid-style Spaces to OS X 10.7 and 10.8.